The first time I saw my wife I was attracted to her. We were students in Bible school, and I was introduced to her in the school cafeteria during the lunch hour. After our brief visit I knew that I wanted to talk with her again. I arranged for a triple date with some other friends. The date was a picnic in the country. It turned out to be a big hit, and I knew that I wanted to keep seeing her. The more I knew her, the more I wanted to know her. In order to find out if she felt the same way about me, I would sometimes ask one of her close friends if she ever said anything about me. Whenever I heard something positive or encouraging it would make my day. My hopes soared, my confidence increased, and my heart grew closer to hers. 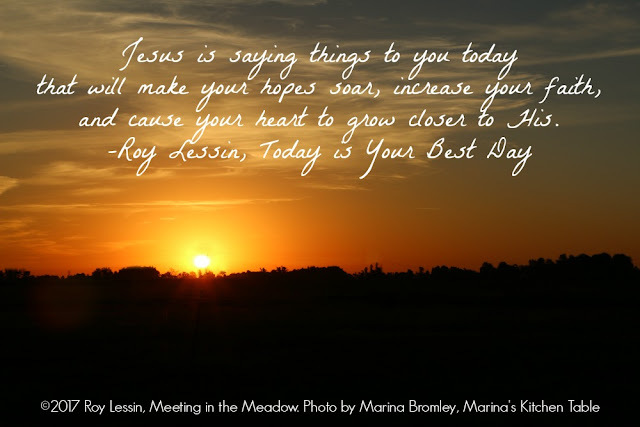 Jesus is saying things to you today that will make your hopes soar, increase your faith, and cause your heart to grow closer to His. Here are some things that Jesus is saying to you today (and some of the things He isn't saying). He doesn't say: Get away from Me. He says: "Come to Me." He doesn't say: What I have to give is not available to you. He says: "Abide in Me." He doesn't say: You'll have to figure things out for yourself. He says: "I am with you always." He doesn't say: I will cut you off from My blessings. He says: "Come to Me and drink." He doesn't say: I cannot use you. He says: "I will make you fishers of men." He doesn't say: Give Me a good reason to love you. He says: "I love you." He doesn't say: You don't fit in My circle. He says: "I have called you friend." He doesn't say: You are of no interest to Me. He says: "I have prayed for you." He doesn't say: You will not be welcome in heaven. He says: "I go to prepare a place for you." ©2017 Roy Lessin, Today is Your Best Day. Used with permission.